Rowers are the athletes with the oars. 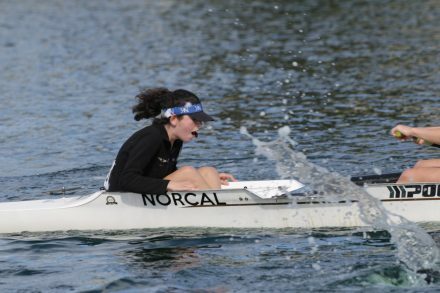 A coxswain is the small (less than 110 lbs for women and 120 lbs for men) person who steers the boat and motivates the crew. While a boat doesn’t move without its rowers, coxswains are also an integral part of the team. They make sure their crews are safe, go in the right direction, and use a microphone and speaker system throughout the boats to motivate and coach their crews. There are two types of rowing: sweep and sculling. Sweep rowing is when each rower has one oar, either on the right or on the left. Sculling is when each rower has two smaller oars, one in each hand. Masters: Age 21+ (for some regattas, this is age 27 or age 30). Masters “A” is younger than masters “B”, and so on. Freshman: A freshman in school. 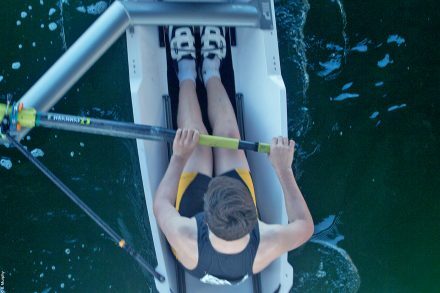 Freshmen can be novice or skilled rowers. There are two weight classes in rowing: openweight and lightweight. Openweight means the rowers can be of any weight. Lightweight means the rowers must be under a certain weight. For men, this is 160 lbs and for women, 130 lbs. The benefit of having weight classes in rowing is that weight affects not only the amount of height and muscle that an athlete has, but also how much mass an athlete has to adversely affect the acceleration of the boat. Lightweight crews tend to be slower than openweight crews, though only marginally. Lightweight rowing is popular at the junior level because many of the athletes have not finished growing yet. Coxswains have their own weight limitations and do not affect the weight classification of a crew. Boats can seat one, two, four, or eight rowers. The sculling boats are singles (one rower), doubles (two rowers), and quads (four rowers). The sweep boats are pairs (two rowers), fours (four rowers), and eights (eight rowers). 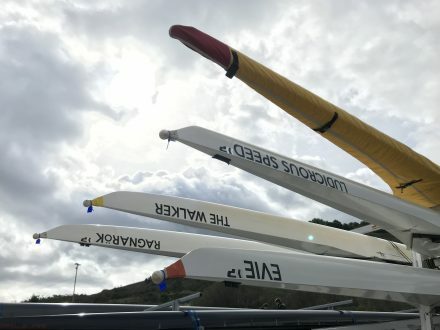 Eights always have a coxswains, whereas quads and fours can be with or without a coxswain (called a “straight” four/quad). Singles, doubles, and pairs do not have coxswains. Coxswains are designated with a “+”, whereas “-” means without a coxswain. 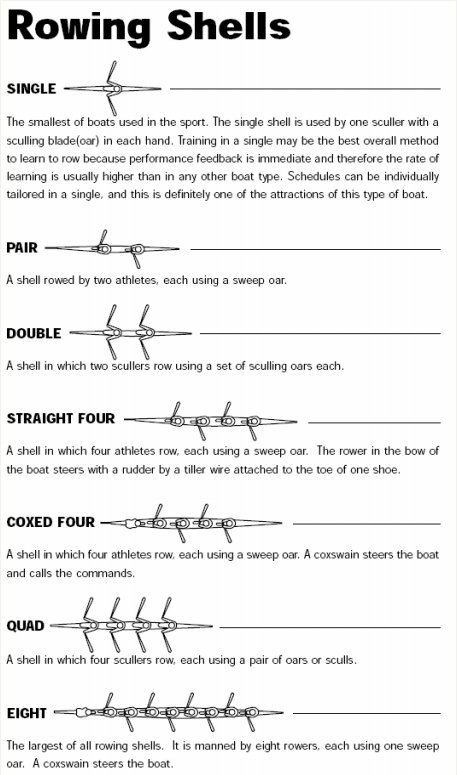 Example: 4- is a straight four and 4+ is a four with a coxswain. Sweep rowing has no special symbol, but “x” is used to represent sculling. Example: 2- is a pair and 2x is a double. Crew: The group of people in a boat. This term is often used synonymously with “rowing” as a term for the sport in general. Erg: Short for ergometer, this is an on-land rowing machine. It is useful as a teaching tool for technique, and it also provides an extremely good workout! It can be used to monitor individual progress in rowing. Port: The left side of the boat (right side for a rower who is sitting backwards). Port side is red. Starboard: The right side of the boat (left side for a rower who is sitting backwards). Starboard side is green. Coxbox: Coxboxes are connected throughout the boat to a speaker system and microphone so the crew can hear the coxswain. Coxboxes are also connected to a magnet under one of the seats to keep track of the number of strokes per minute that the crew takes. Stroke Seat: The rower sitting the furthest in front of a crew, or the most toward the stern. This person sets a rhythm for the crew to follow in their stroke. Bow Seat/Bowman: The person sitting the furthest in back of a crew, or the most toward the bow. Seat numbers: Seat number count up from the bow. For example, bowman is seat #1, the person in front of them is seat #2, etc. In an 8+ (eight with coxswain), stroke seat is seat #8.